Our bees are kept on the ranch to aid the pollination of apricots, and it is really satisfying to see and hear them in the orchard at blossom time. Of course, they work throughout the year, except on rainy days, gathering pollen and nectar from up to a 2 mile radius. 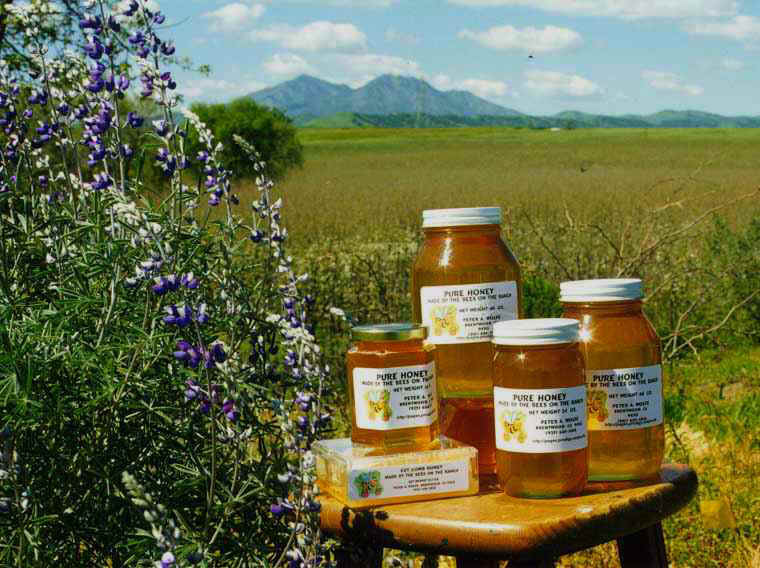 They visit apricot, cherry, almond, peach, and loquat blossoms, as well as local vegetables and many varieties of wild flowers and grasses up and down Marsh Creek and in the hills towards Mt. Diablo. Unlike some store bought honey that is micro filtered, we filter only the wax particles from our honey. Some of the pollen, which is carried in with the nectar, gets mixed with the honey by the bees and remains in the jar. Sorry, the bees did not make cut comb honey this fall.